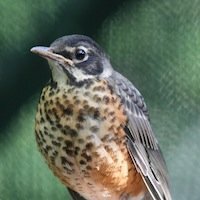 With summer upon us, the Centre is now in full swing and caring for over 150 songbirds. That’s in addition to 100 abandoned and orphaned waterfowl, such as ducklings and geese, currently under our care. 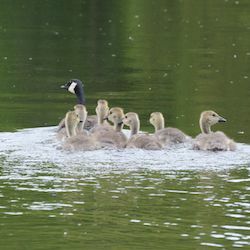 Earlier in the season, Le Nichoir received seven nestling Canada Geese, mostly from different clutches. Geese can be difficult to care for because they become habituated to people very easily. And once that happens, the birds cannot be released into the wild. So in this particular case, staff and volunteers tried to make sure the goslings were disturbed only to be fed and cleaned. Still, there was some concern that, even with the young birds almost completely isolated from people, they would become friendly and approach us. What they really needed was a mother goose. 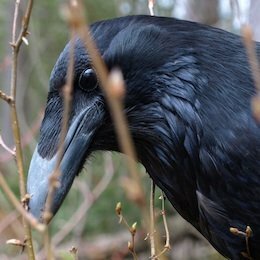 In late summer 2011, Le Nichoir received a juvenile Common Raven that had been found as a fledgling and kept as a house pet for three months. The bird was habituated to humans, so the Centre could not release it until it developed a fear of people. Although Le Nichoir does not usually transfer birds to foster homes, it was in the best interest of the raven to place it in the care of Jim Doyle, a professional licensed falconer who has worked closely with the Centre in the past. Le Nichoir was confident that Jim had the skills and training to do a successful slow release. In his care, the bird could fly free during this process instead of being in a flight cage at Le Nichoir. 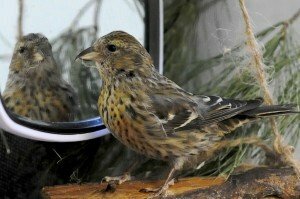 On a clear spring-like day this March, Le Nichoir released a healthy White-winged Crossbill in a large spruce stand, ending a two-month stay for the injured bird originally found 1,200 km north of Montreal, in Waskaganish, Que. The female Crossbill (Loxia leucoptera) had made the nine-hour journey to Le Nichoir last December in the care of the couple who spotted the juvenile bird and looked after it until they were able to make arrangements to travel to Hudson. Case:The fledgling bird was found fallen from his condo after a large thunderstorm. The bird was cold, very dehydrated and thin. The bird also had some abdominal bleeding. The parents had abandoned the bird. Treatment: The fledgling was stabilized by providing it with heat and subcutaneous fluids multiple times a day. The bird was also weighed on a daily basis. It was fed a variety of insects and vitamin supplementation every hour. It was also provided with live house and fruit flies. 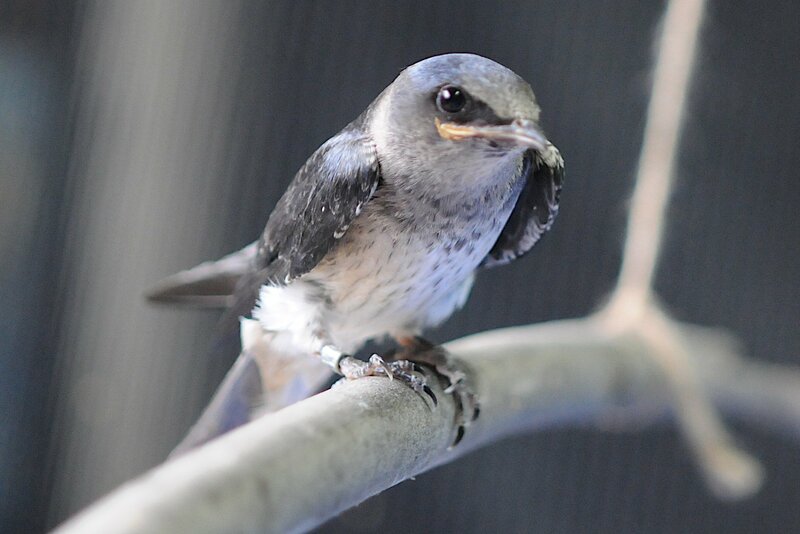 Outcome: The bird was banded by McGill Bird Observatory and released three weeks later at the location where it had been found – the Purple martin condos at Valois Park in Dorval, Quebec. Luckily, the bird was released just before the martins migrated south. Did you know?……. Purple martins are the largest members of the swallow family in North America. Purple martins nest mostly in man-made houses that can hold hundreds of birds; they have been doing so for the past 100 years! On July 12 2011 over 170 Ring-billed Gulls were banded and released into an existing colony at Beauharnois, QC with the help of researchers from UQÀM. The group are studying the behavior of Ring-billed Gulls in urban and suburban settings. 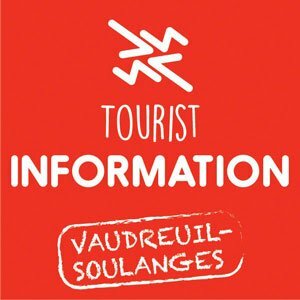 The released gulls had come to Le Nichoir as days old nestlings several weeks earlier after having fallen from the roof of an industrial building on Montée-de-Liesse in Ville Saint-Laurent. The gulls were cared for by Le Nichoir staff and volunteers until they were deemed able to integrate into the existing colony and care for themselves. 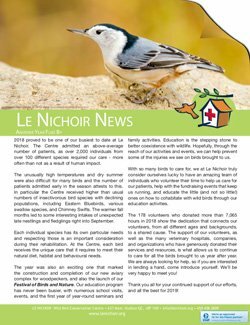 Many concerned individuals and companies made generous donations that allowed Le Nichoir to take on the challenge of caring for these birds. Issue: This healthy waxwing was captured by a well meaning person. Treatment: Le Nichoir first tried to reunite the waxwing with its parents but was not able to find the exact location where the bird was found. The Centre decided to care for this fledgling until it was mature enough and able to fly. 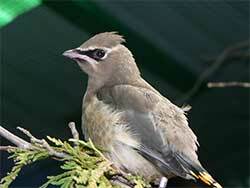 Result: The waxwing stayed at the Centre for 3 weeks. It was placed in one of the outdoor aviaries where it was able to fly and was fed a variety of different naturals foods, similar to those found in the wild. Did you know? That baby birds that fledge (fledglings) fall or are thrown from the nest even though they cannot fly? 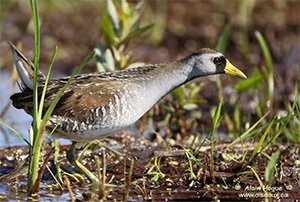 They will roam around, on the ground, for up to 3 weeks before they can fly away. During this time, the parents will feed them every couple of hours and protect them from predators. If you find a fledgling bird, the best thing is to leave it be. This is part of their growing process, and part of nature. First published in the Hudson/Saint-Lazare Gazette and are reprinted here with permission. 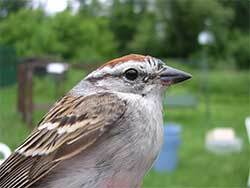 Issue: This sparrow was brought to the Centre because it flew into a resident of Hudson’s bay window. Treatment: The bird was not moving and in shock. It was placed in the Bird Protection Quebec’s “Quiet Room” to recuperate where there is minimal noise and no visitors. It was given pain management and within 48 hours, the sparrow was flying normally and ready for release. Result: A young volunteer released the sparrow back where it was found, near Cameron Street, and it was able to rejoin its small flock. Did you know? 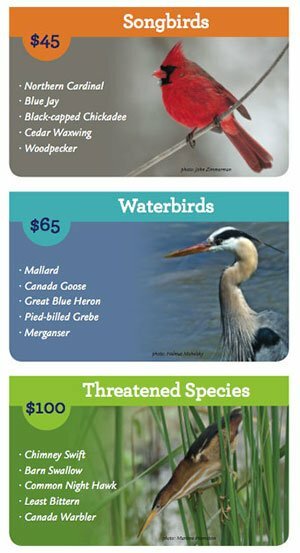 You can prevent wild birds from hitting your windows by hanging ribbons, drawing designs with a yellow highlighter (birds can see ultra-violet light) or by putting silhouettes of birds of prey in your window. You can also spray soapy water on the glass to reduce the reflection.